While the owners are away the designers will play! This Bellevue craftsman stunner went through a large remodel while its occupants were living in Europe. Almost every room in the home was touched to give it the beautiful update it deserved. A vibrant yellow front door mixed with a few farmhouse touches on the exterior provide a casual yet upscale feel. 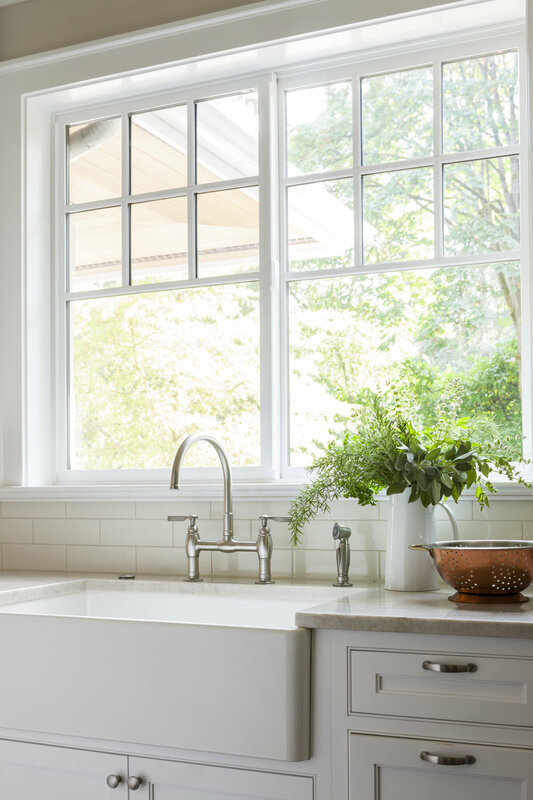 From the craftsman style millwork seen through out, to the carefully selected finishes in the kitchen and bathrooms, to a dreamy backyard retreat, it is clear from the moment you walk through the door not a design detail was missed. Being a busy family, the clients requested a great room fit for entertaining. A breakfast nook off the kitchen with upholstered chairs and bench cushions provides a cozy corner with a lot of seating - a perfect spot for a "kids" table so the adults can wine and dine in the formal dining room. Pops of blue and yellow brighten the neutral palette and create a playful environment for a sophisticated space. Painted cabinets in the office, floral wallpaper in the powder bathroom, a swing in one of the daughter's rooms, and a hidden cabinet in the pantry only the adults know about are a few of the elements curated to create the customized home my clients were looking for.